The powder comes packaged in a simple white case. 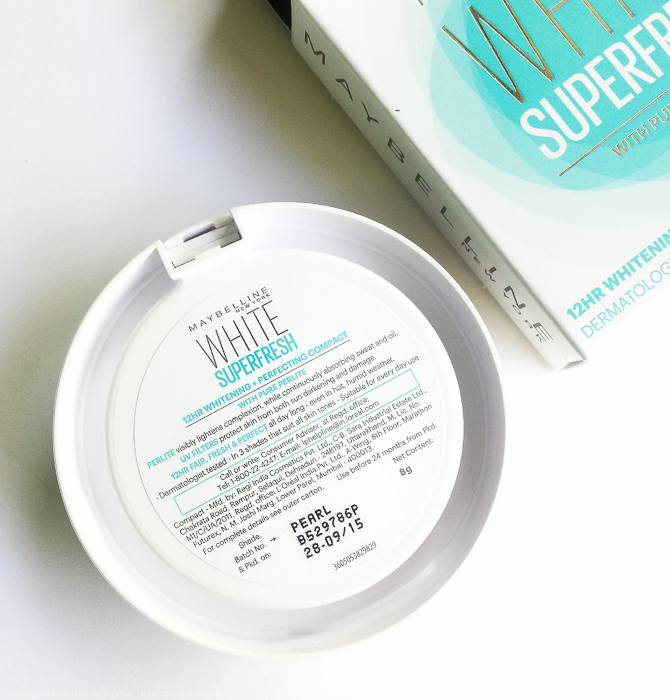 Claims include 12 hour whitening/perfecting properties with pure Perlite. Oil-absorbing, brightening powder with UV filters for sun protection. Compact includes a puff and a clear plastic disc that covers the powder and separates the puff from the powder. The disc helps keep the powder from spreading around and also helps keep it clean. 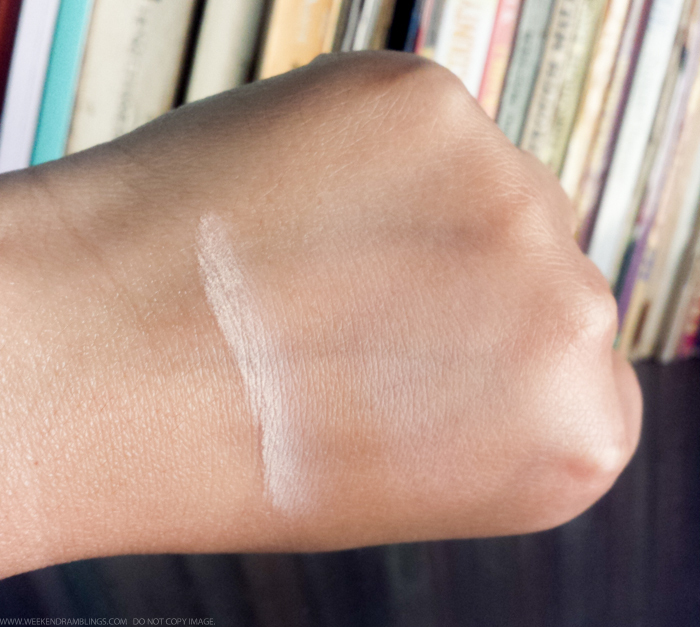 This shade seems best suited for lighter skin tones. I apply the powder using a fluffy powder brush in a sheer layer, applying the product only on to the oilier areas of my face. Patting the powder on to the face with the included sponge will give a slightly heavier application. It's also convenient to use for touch-ups during the day. 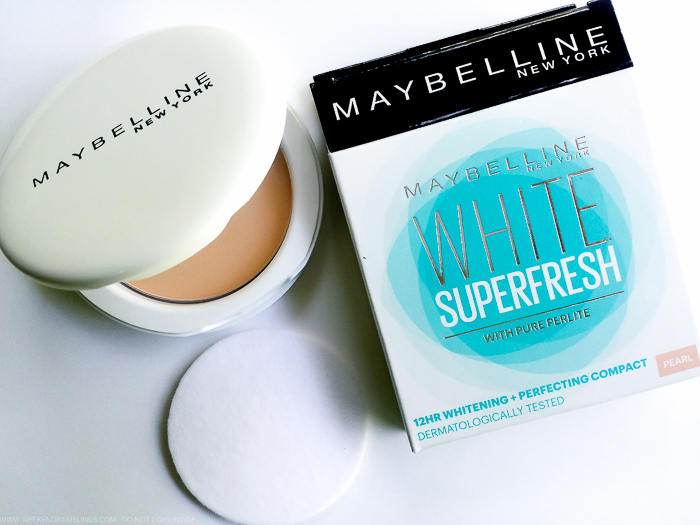 Maybelline White Superfresh Compact is a pressed powder compact that comes packaged in a simple white compact which is light and convenient to carry around in the bag. 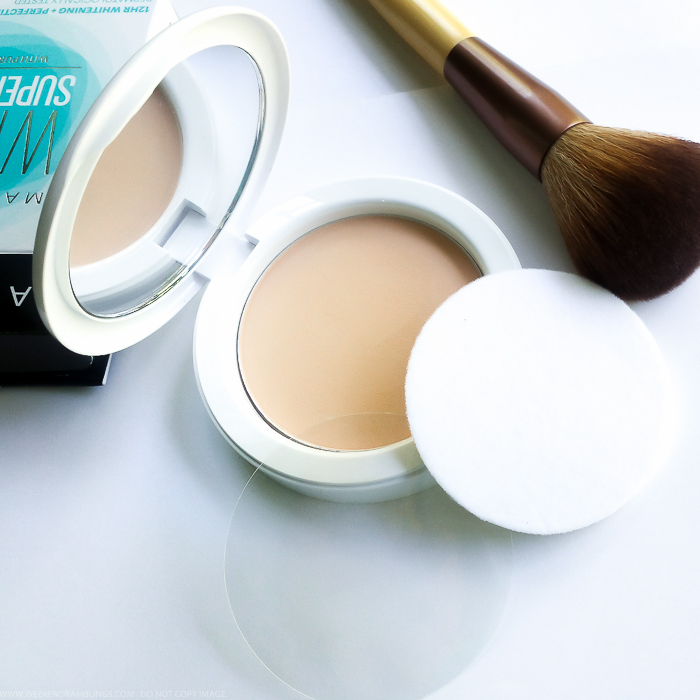 The compact includes a mirror on one side, a sponge applicator, and a clear plastic disc covering the powder. Try to replace the disc after each use as it helps keep the powder from spreading around and clouding the mirror, and it also helps keep the used puff/applicator from touching the powder. On to the powder itself, it's a fine powder that can be applied sheer using a fluffy powder brush or with the provided sponge for heavier application. It is quite a mattifying powder, and on my oily-combination skin, I only use this on the oilier areas of my face. I do find it a bit drying for the normal-dry areas on my skin. 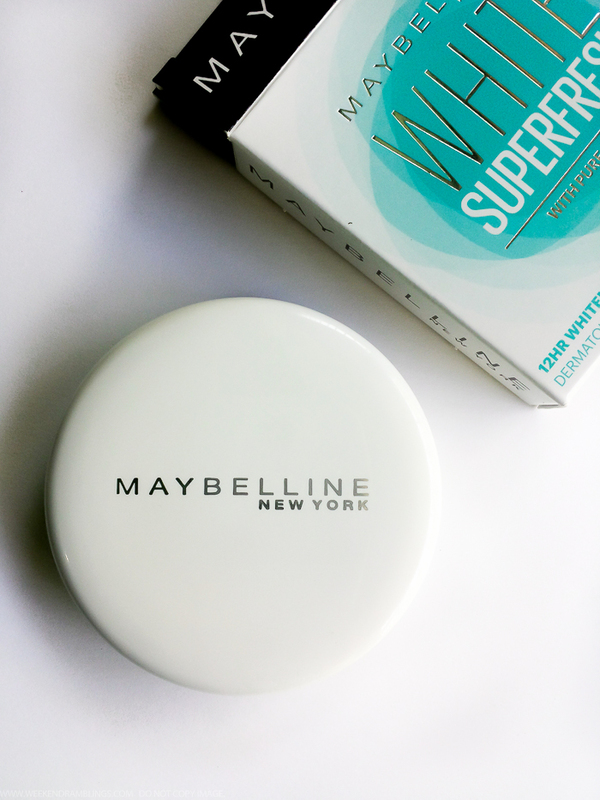 As a basic setting powder, I found the Maybelline Superfresh compact quite good. It keeps my makeup in place and keeps my skin from getting too oily as the day goes on. I cannot vouch for the brightening/whitening properties of the powder, and it's not something I look for in a powder either, but I do appreciate the additional UV protection this powder offers. My only gripe with this product would be the lack of an ingredients list on the packaging and no clear information regarding the sun protection factor. The shade options are limited too, though you can get away with not too exact a match if you aren't applying too heavily. 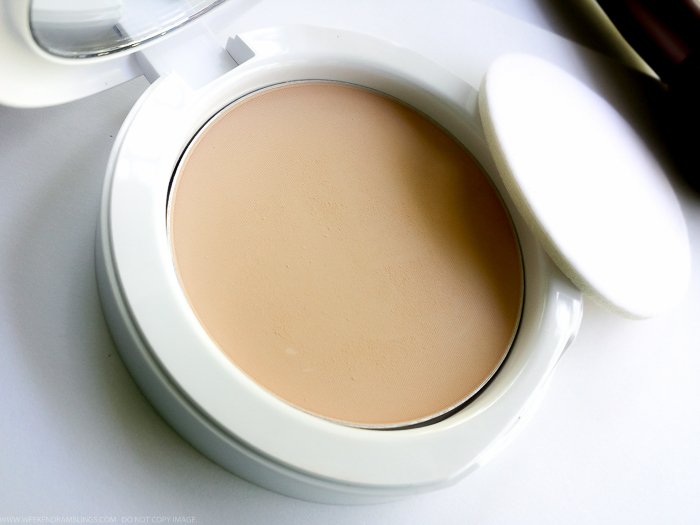 These few issues aside, I found this pressed powder compact quite good. Verdict: Good option for those looking for an affordable pressed powder compact with some oil-control properties as well as added sun protection benefits. Bonus: Travel-friendly convenient packaging that's perfect for touch-ups on the go. Product featured in this post has been provided for review.